Research proves that sitting too long increases your risk for a slew of health problems including heart disease, cancer and Type 2 diabetes - not to mention the sore lower back, tight shoulders and stiff neck that often accompany sitting in an office chair all day. Taking a few minutes out of your workday for some office yoga is a great way to counter these concerns. And you'll enjoy a little stress relief to boot! This is one of our favorite moves for stretching and gently opening up the lower body, including your hips, lower back and calves. It’s also amazing for improving circulation and relieving stress. To perform this move, simply stand with your feet hip-width apart. Slowly fold your body forward, placing your hands on the floor in front of you. If you can’t reach the floor comfortably, bend your knees slightly or simply grab your opposite elbows and hang there. Stay in this position for several breaths. Open up your inner hips with this classic yoga move. Simply place your left foot three to four feet back, rotating the foot out to 90 degrees. Extend your arms out to the side, keeping them parallel to the floor with your palms facing down. Look to your right fingertips as you bend the right knee forward over your right heel. Hold the pose for several deep breaths before switching to the other side. Extend your spine and alleviate upper body stiffness with this move that will help you take deeper breaths throughout the day. Simply move to the edge of your chair with your feet flat on the floor at a 90-degree angle. Relax your arms by your side. 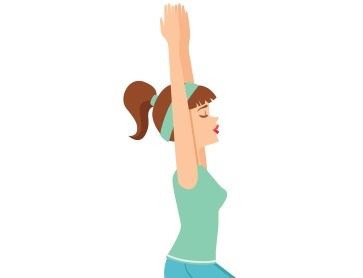 Inhale deeply as you stretch your right arm up to the ceiling, and slowly stretching to the left. Be sure to keep your hips in place and your torso straight. Take a few breaths before switching to the other side. Hours of being cramped at your desk can take its toll on your lower body. Loosen your hip flexors with this move, which can be performed sitting or standing! For a standing pigeon pose, bring your feet together, bend your knees slightly, and place your right ankle on top of your left knee. 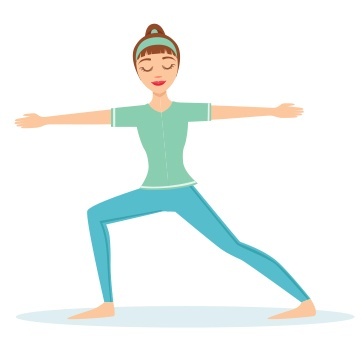 Remain in this pose until you feel the stretch in your outer hip, and then switch to the other leg. For the seated version, sit at the edge of your chair with your feet flat on the floor. Again, place your right ankle over your left knee, keeping your shin parallel to the floor. Hold for several breaths before switching sides. Relieve your aching back with this move, which includes a bonus benefit of improving digestion! Simply sit in your chair with a very straight spine. Inhale deeply. 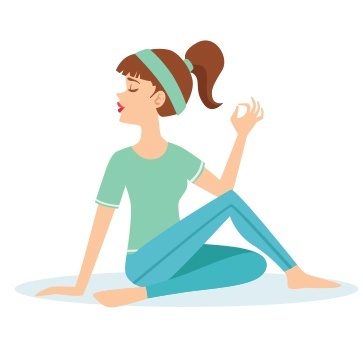 On the exhale, slowly twist your spine to one side as you grab the arm of the chair behind you. From the twisted position, take a few deep breaths before performing on the other side. This move is amazing for loosening up your shoulders and neck, and counteracting the hunching over we all tend to do after hours of sitting behind a computer. From a seated position, place your hands on the desk in front of you and push your chair out until your arms are completely extended. Drop your head between your arms to get a good shoulder stretch.